CD review: "House Party New Orleans Style"
Of all New Orleans' fabled sons, none was more undeservedly unknown than Henry Roeland Byrd, better known as Professor Longhair, or Fess. Longhair was one of this country's most talented, versatile and individualistic pianists. His music was drawn from the creole and Cajun sounds of his native southern Louisiana, and was a direct descendant of Jelly Roll Morton and Scott Joplin. And Longhair's influence is still felt today through those who modeled their playing on his, most notably in Allen Toussaint and Dr. John. After some significant regional (and even brief national) success in the 1940s and '50s, Longhair dropped out of the music business in the 1960s. Fortunately for us, he was rediscovered by Quint Davis in 1971 and recorded prolifically for most of the 1970s before his death in 1980. This release features cuts Longhair laid down in his first sessions in his 1971 return. Guitarist Snooks Eaglin anchors the band, and balances Fess' rollicking boogie woogie with a more straight-ahead sensibility that doesn't get in the way of what the good professor is doing. Found here are excellent versions of most of Longhair's standard repertoire, including "Tipitina," "Hey Little Girl," "Junco Partner" and "Dr. 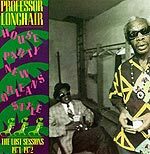 Professor Longhair." The performances here are taken at a slower pace than on many other recordings, allowing Longhair to stretch out more vocally with that voice that Toussaint called "freak unique." A real surprise is "Everyday I Have the Blues," which Longhair manages to make sound as if it belongs to him personally.